The Wongawilli Colonial Dance Club is pleased to announce the release of a new publication of Australian folk dance music. A collection of 45 jigs, set tunes, polkas, mazurkas, waltzes and schottisches and 2 songs. Written and music transcribed by Alan Musgrove and designed and compiled by David De Santi. Available from Illawarra Folk Club Store for $20 plus postage and package. John McKinnon is a traditional dance musician from the Ecklin South district of Victoria, between Colac and Warnambool. When John was about ten or eleven his father bought him a Nightingale German accordion in Melbourne which he quickly learnt to play. At twelve years old, John McKinnon played at his first dance. John began playing around the districts of Ecklin, Dixie, and Ayrford. There was plenty of opportunity with regular dances, welcome home parties, and kitchen teas which were popular parties to honour an engaged couple and their families. John was keen to help a new generation of young musicians to take over the dance bands which were in great demand due to the revival of old time and new vogue dancing. He was also anxious to acknowledge his debt to the musicians and dancers who helped him to become one of Australia’s foremost dance band musicians. John McKinnon’s tapes were enormously successful, selling all over Australia. 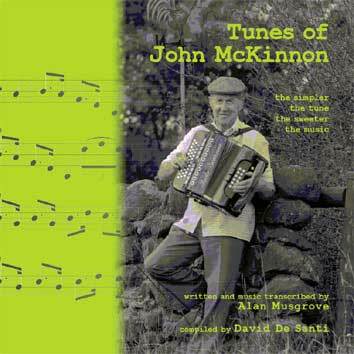 Australian folk music collectors John Meredith, Alan Musgrove and Edgar Waters have recorded John McKinnon’s traditional accordion music. The tapes are housed in the Oral History Section of the National Library of Australia in Canberra. This is a rare collection of some fine old tunes - worth preserving and playing. The book was launched at the 26th Illawarra Folk Festival held in January by Peter Ellis.